Welcome to Get Going’s privacy notice. Get Going is a trading brand name of Travel Insurance Facilities Plc (tifgroup), which is a UK acting branch for Union Reiseversicherung Ag (the Insurer). tifgroup manages and administrates your data to perform its obligations under your contract when you purchase a travel insurance policy with Get Going. tifgroup is the controller and responsible for your personal data collectively referred to as tifgroup, “we”, “us” or “our” in this privacy notice. tifgroup respects your privacy and is committed to protecting your personal data. This privacy notice will inform you as to how we look after your personal data when you visit our website (regardless of where you visit it from) and tell you about your privacy rights and how the law protects you. This privacy notice aims to give you information on how tifgroup collects and processes your personal data through your use of this website and purchasing travel insurance with us, including sign up to our newsletter, purchase of a travel insurance product or take part in a competition. It is important that you read this privacy notice together with any other privacy notice or fair processing notice we may provide on specific occasions when we are collecting or processing personal data about you so that you are fully aware of how and why we are using your data. This privacy notice supplements the other notices and it not intended to override them. This version was last updated on 21st May 2018, historic copies are archived and can be obtained by contacting us. Contact Data includes billing address, postal address, email address and telephone numbers. Financial Data includes bank account and payment card details to purchase a policy. Financial data will be encrypted accordingly. Health and Medical Information includes medical history obtained from you, GP records (with your express consent), medical reports from hospitals abroad and other medical information required to fulfil our obligation as your travel insurer. Point of Sale (when you contact the call centre and/or use our online customer journey) – we will obtain your medical history. Emergency Medical Assistance – current medical situation and potentially revisiting medical history, medical reports, medical advice in relation to you and your travel companion. Claims – document to evident your claim such as a copy of your passport or driving licence, share details to fraud agencies or contacting your GP with consent. Advertising networks such as Affiliates based in the UK. Identity and Contact Data from data brokers or aggregators within the EU. Where we need to perform our obligations within your contract we are about to enter into or have entered into with you. Where we obtain consent to send any marketing materials. 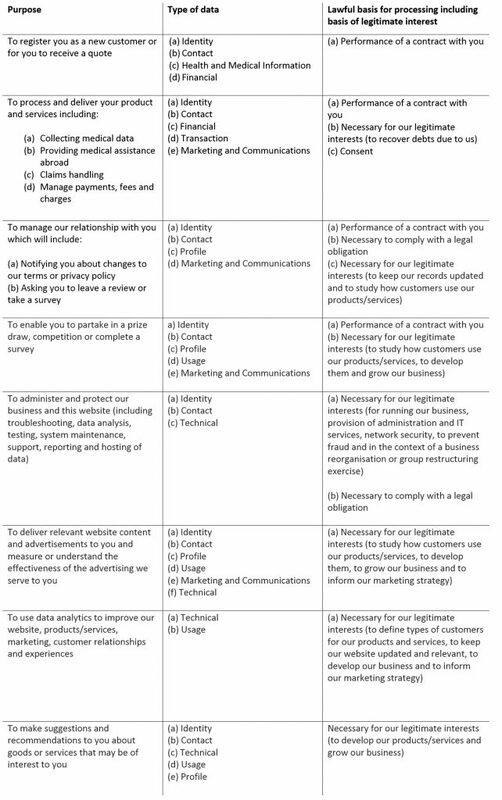 We have set out below, in a table format, a description of all the ways we plan to use your personal data, and which of the legal bases we rely on to do so. We have also identified what our legitimate interests are where appropriate. On the basis we use your personal data under the grounds of Legitimate Interests we will compile and record a Legitimate Interest Assessment to protect your rights and freedoms. We strive to provide you with choices regarding certain personal data uses, particularly around marketing and advertising. We have established methods to provide you an option to make a decision whether you would like to receive marketing materials. If you would like us to stop sending certain or any marketing materials you may opt out by contacting us. You will receive marketing communications from us if you have requested information from us or purchased insurance products from us or if you provided us with your details when you entered a competition or registered for a promotion and, in each case, you have not opted out of receiving that marketing. We will get your explicit opt-in consent before we share your personal data with any company other than tifgroup for marketing purposes. We may have to share your personal data with the parties set out below for the purposes set out in the table in set out in the table in paragraph 4 above. External Third Parties as set out in the Glossary, which tifgroup will be in a legal binding contract. Third parties to whom we decide to go into business with, for example sell travel insurance on tifgroup’s behalf, transfer, or merge parts of our business or our assets. Alternatively, we may seek to acquire other businesses or merge with them. If a change happens to our business, then the new owners may use your personal data in the same way as set out in this privacy notice. Automated decision-making is the making of a decision about you based solely on automated means without any human involvement. This occurs when we conduct a medical screening at the beginning of your customer journey either online or through our call centre. The system is pre-programmed algorithms that assist in calculating your premiums. You have the right to object to profiling and automated decision-making as set out below. In these circumstances, you have the right to request an adviser of tifgroup to review the automated decision, as part of this process you also have the option to let tifgroup know the reason for your objection and ask us for a reconsideration of the decision. You can contact tifgroup to exercise these rights by contacting us. Underwriters: our underwriters will assess risk, calculating premiums and what kind of cover we can offer. The type of data we will process are Identity Data and information about your trip for us to understand the likelihood of a certain event that may occur. With the results, we will determine the premiums and extent of cover. Medical screening: we use a risk rating tool which determines the answers given to the relevant questions that we deem relevant to purchase insurance. This permits us to understand the risk of the medical condition declared against factors such as the destination chosen, duration of the holiday, and type of trip you have chosen to go on. let you know in writing what we have done to meet your request, and the outcome. Our IT estates are protected by enterprise level hardware based firewall systems, with scans being performed regularly to ensure that any vulnerabilities are quickly found and patched. Annual penetration tests are performed by external parties. All services have auto fail-over points and redundant hardware, with complete backups performed as a minimum daily. Access to systems is severely restricted to specific individuals, whose access is monitored and audited. Access levels are granted based on user role and changes are subject to strict pre-approval processes. All client data encrypted at rest and is stored within UK based data centres, within tifgroup controlled infrastructure. Our applications utilise Transport Layer Security (TLS) & Secure Socket Layer (SSL) encryption (also known as HTTPS) for all transmitted data. We also protect applications with encrypted passwords. After your policy expires with us, we may keep your data for up to 7 years. It is our standard practice to only send transcripts of telephone recordings to you or any third party unless it is deemed absolutely necessary to disclose the recordings. Medical doctor apps acting as data controller to provide medical assistance on behalf of tifgroup’s emergency medical assistance.